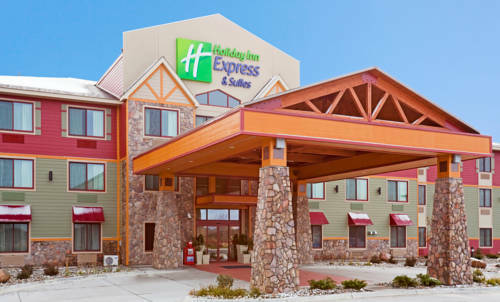 Visitors to the Holiday Inn Express Mountain Iron - Virginia, MN hotel can expect quality service, great location and excellent accommodations. Mt. Iron and Virginia, MN offer our hotel's guests access to all the Iron Range has to offer and our location near Hibbing Airport makes travel a breeze. The hotel offers a complimentary shuttle within a 5 mile radius with a 48-hour notice if a driver is available. Leisure guests love how close we are to Iron Range attractions like the US Hockey Hall of Fame, Mine View in the Sky and Minnesota Discovery Center. Giants Ridge Golf & Ski area is nearby as well, providing guests with entertainment year-round. This Virginia, MN area hotel's business services are top-notch. Corporate guests staying in Mountain Iron love our free high-speed Internet access, and we offer flexible meeting space as well. Our hotel in Mountain Iron is located near area businesses such as US Steel-MinnTac, Cleveland Cliffs: United Taconite / Hibbing Taconite, Poly Met Mining Corp. and the ArcelorMittal Minorca mine. We invite you to enjoy our Virginia, MN area hotel's many perks including a heated, indoor pool and whirlpool, 24-hour Fitness Center and a complimentary, hot breakfast bar and IHG Rewards Club Reception Monday through Thursday. Whatever your travel needs may be, you are sure to find all the amenities necessary for a great trip at the Holiday Inn Express Mountain Iron - Virginia, MN. PERKINS IS IN WALKING DISTANCE OF THE HOTEL. Board Room style meeting room that seats 20 around boardroom table. Walmart, Maurices and Famous Footwear within walking distance. An elevator drops you a half-mile beneath the surface, then a train takes you down another quarter-mile. ~28 miles from Mountain Iron. A 14-foot-long leaping fiberglass fish -- with a saddle on its back and a ladder to get to it. A fun photo-op. ~65 miles from Mountain Iron. Over 1,000 accordions and related wheezy music-makers are displayed in large, repurposed church. ~60 miles from Mountain Iron. The 3M company has an exhibit on its raspy invention, along with other 3M products, in the historic house where the company began. ~56 miles from Mountain Iron.